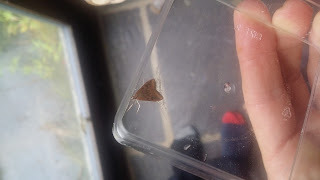 Carmarthenshire Moth and Butterfly Group: Rusty-dot Pearl? I am a bit confused with this one. Could it be a Rusty-dot pearl. Not had this species before. As always any help on this much appreciated. Thanks. Looks good to me Sally (but what do I know?). Probably a lot more than I do - thanks Steve! Yes, rusty dot pearl Sally. I suspect that there were a few common migrants to be had over the last week but the rain and wind put many of us off trapping (esp rain first thing in the morning with me! ).